« Obama born in Kenya II? It all started with a telephone call from a fellow who gave his name as “Billy Birther.” Naturally, with a name like that, I took the call with a large grain of salt. Billy Birther said he had some interesting information and would like to meet me for an interview. I was just about to hang up, when the fellow confessed that his name was not really Billy Birther, but that he was a well-placed individual in the government and needed to hide his identity. Curiosity got the better of me, and I consented to interview the fellow, but at my home – you can never be too safe. When “Mr. Birther” arrived, I recognized him from the news, but did not let on. Yes, Billy, what is it that you want to tell me? You should be able to guess that by my name. 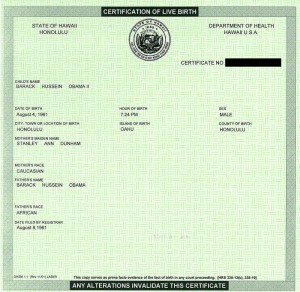 The “birthers” are those who believe that Obama was born in Kenya. I have proof of that. In all due respect, Billy, this issue has been settled, as Obama’s Hawaiian birth certificate has been published on the Internet. Do you doubt its authenticity? No, not at all. Nor do I deny the authenticity of the reports of Obama’s birth in the Hawaiian newspapers. It is interesting, however, that Obama’s Hawaiian birth certificate number has been blanked out. Here is a copy of it. Just for the record, the certificate number is 151-1961-01D641. Well then, what are we talking about? Many people have valid birth certificates from two countries. (Billy smiling) Let me explain. For example, many Mexicans are born in the U.S. In some cases, their parents than rush the baby into Mexico, where they declare to the Mexican authorities that the baby was born at home in Mexico, and they are issued a Mexican birth certificate. Really. This way when the baby grows up there is a choice of which birth certificate and which passport to use—or both can be used, depending on circumstances. But what about the announcements of Obama’s birth in the Hawaiian newspapers, The Sunday Advertiser, and The Star Bulletin? Please! Don’t you know those are automatic and are received by the newspapers as a result of the filing of the birth certificate. It’s the same as for marriages and deaths. Oh… Well, is there any evidence of Obama’s being born in Kenya? (Birther reached into his briefcase) Here it is. Well, OK, but what’s to say that Obama wasn’t born in Hawaii and THEN transported to Kenya to be registered there. 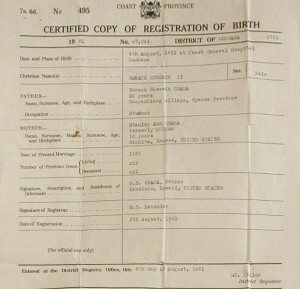 (Birther impatiently) Obama’s Kenyan birth certificate gives the name of the hospital where he was born, at the Coast General Hospital in Mombassa. No hospital is given on Obama’s Hawaiian birth certificate. Even the Mexicans who are born in America normally have a hospital record, but not Obama. Was he hatched from an egg in his grandmother’s house? Where’s Obama’s Hawaiian hospital record? Also, may I point out that Obama’s Kenyan birth certificate is filed on August 5th, three days earlier than Obama’s Hawaiian birth certificate which was filed on August 8th—plenty of time to travel from Kenya to Hawaii. You have a point there, Mr. Birther. 5 comments to Obama born in Kenya? The question mark (?) in your interesting article’s title is appropriate, However, I predict someday that same statement will appear in bold headlines worldwide followed by an exclamation point (!). 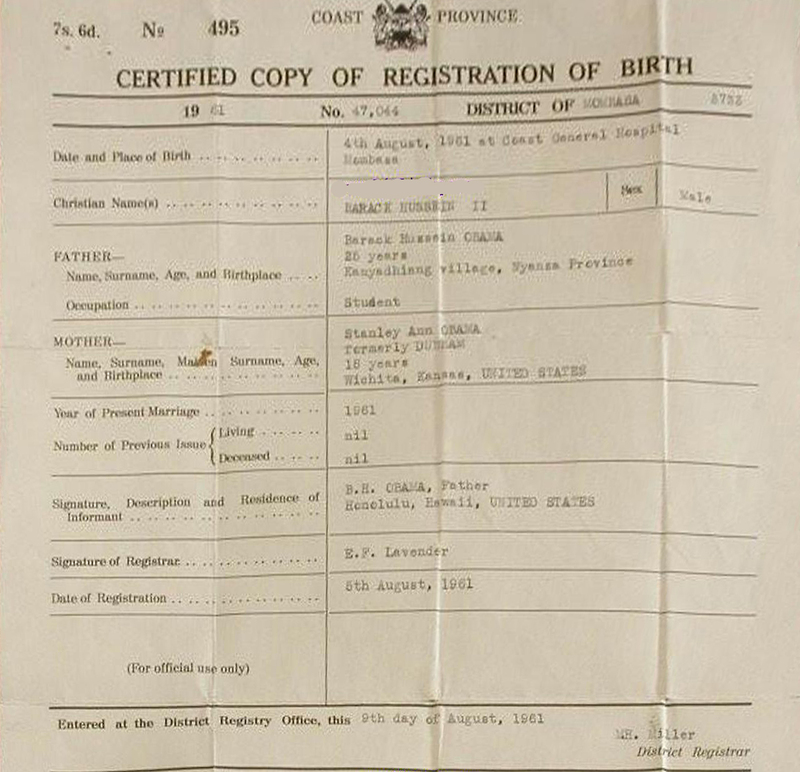 Perhaps you will agree after you examine the ‘true original’ birth certificate of Barack Hussein Obama II from the Coast Province General Hospital in Mombasa, Kenya. A high resolution copy is available for free download at WasObamaBornInKenya.com. The Hawaiian Certification of Live Birth (COLB) foisted upon a confused American public by Mr. Obama neither identifies nor bears a signature of the attending doctor and it does not even name the birth hospital. That internet image has already been changed 4 times and it does not give the date ‘Accepted’ as it should, but only the date ‘Filed’. Recent, specialized computer analysis of the ‘original’ COLB displayed on DailyKOS shows that there is no indication of a Serial Number present on the layer beneath the black ‘redact panel’, indicating forgery of the document. It sounds possible – you mean he was born in Kenya and then hustled to Hawaii in order to have an American birth certificate and therefore citizenship? It’s surely dangerous to travel so far with a newborn baby. Germs. Does this mean his Hawaiian birth certificate is false? So if he is actually Kenyan, by law he is not allowed be president?? that’s terrible. I think he’s doing a great job against huge odds,ie the American conservative mind. Let’s suppress this and let it coem out 100 years from now. By the way, was Hawaii a State when Obama was born? 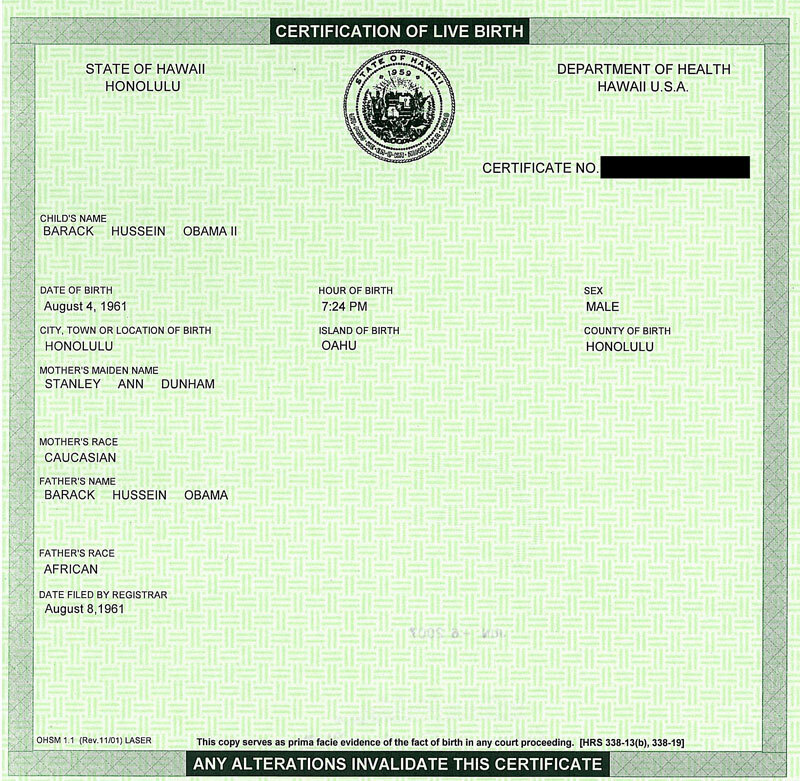 If Obama was brought from Kenya to Hawaii for the purpose of obtaining a U.S. birth certificate, the U.S. birth certificate is false. Depending on the last state of his mother’s residence, Obama could have become a U.S. citizen by obtaining a certificate of a U.S. citizen born abroad. As such he would not qualify to run for the U.S. presidency. Hawaii was a state in 1959, prior to Obama’s birth. Congratulations on the success of your conglomerate, movingaround.com! I obtained a certified copy of de facto President Barack Obama’s 1961 Coast Province General Hospital, Mombasa, birth certificate. I obtained the copy, from the hospital itself, on February 19, 2009. I have since entered entered affidavits and declarations into federal Court and also notarized and certfied statements to US Congress.